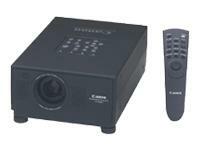 Canon offers this LV 5300 videoprojector. It is easy to carry, simple to set up and is ideal for mobile presentations. With its standard PC card slot and remote control transmitter with mouse, you can show sophisticated multimedia presentations without the need for a personal computer. Despite its small A4 size, the LV 5300 still provides superb picture-perfect quality. Suitable for small groups or in-store use, it gives added impact to your message. It offers real SVGA projection or XGA compressed high quality projection.